ISP Pro Review 2019: Is ISP Pro a Good Hosting? ISPpro Internet was established in January 2003 with an aim to providing high-quality dedicated server solutions. Today, the company hosts over 65,000 private and business websites in Germany. 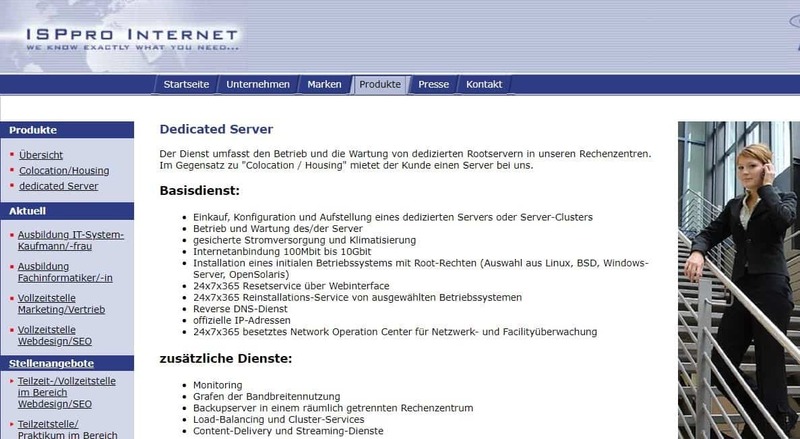 ISPpro Internet provides colocation and dedicated server services to its 65,000+ private and business customers in Germany. The company, together with its sales brands EUserv Internet, Keepfree, and KOS-Online, has over 15 years of experience in the hosting industry backed by superior hosting infrastructure. The ISPpro Internet website is only available in German. ISPpro Internet owns and operates two data centers in Jena and Thuringia, Germany. The data centers are equipped with high capacity infrastructure to provide excellent colocation and dedicated server solutions to its ever-growing clientele. The vendor’s server operation and maintenance solutions include regular reset services via web interface, 24/7/365 reinstallation service of selected operating systems, and Reverse DNS service. In addition, the security of its data centers is top-notch; they have 24/7/365 camera surveillance with infrared and alarm-secured access to prevent intruders from gaining access. While ISPpro claims to also offer other hosting-related solutions like domain registration, domain maintenance, provision of email addresses, webspace for websites, and server and rack housing, there’s no other information about these services on its website. The vendor’s servers provide backup space for its customers where they can keep their backup copies for retrieval in case of a disaster. For customers looking for more straightforward hosting solutions, this vendor’s offerings might not be suitable. The apparent vagueness in its explanations of the solutions it offers would unsettle any would-be customer. Furthermore, the ISPpro website is not mobile-friendly and looks like its design has not been updated for a long time. Indeed, it seems to have maintained an outdated look that makes it unappealing to new customers looking for state-of-the-art hosting solutions. ISPpro Internet has kept its hosting prices hidden. Potential clients have to contact the vendor for more information about its pricing. The vendor does not have a refund policy nor an uptime guarantee for any of its services. Customers can get a hold of ISPpro Internet support team via telephone, contact form, and email, though there is no ticketing system or live chat available to its customers. While the vendor claims to offer 24/7/365 customer support, there is little else on its website that collaborates this claim. Indeed, I sent this vendor a message via its contact form but never got any response. What’s more, the hosting company does not have a knowledge base or an FAQ section on its website. ISPpro does not offer shared web hosting and VPS solutions. The vendor only offers colocation and dedicated servers, yet it does not offer enough information on its website about these solutions. The unresponsive support should serve as a warning bell to any would-be customer of this vendor whose website looks very outdated. Buy server operation and maintenance solutions at ISP Pro! Wondering how ISP Pro stacks up against other Web Hosting companies? Enter any other Web Hosting company and we will give you a side-by-side comparison.